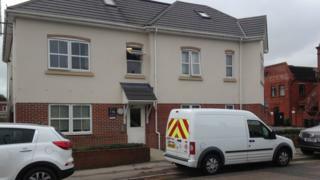 Barbara Rankilor, 75, was found with 70% burns in her smoke-filled home in Cranleigh Road, Bournemouth, on 8 November and died later in hospital. Senior Dorset coroner, Sheriff Payne, concluded her death was accidental. The hearing was told that Ms Rankilor was immobile and spent most of her time in a recliner chair. On the day of the fire, neighbours heard her smoke alarm and saw black smoke billowing from the property in Southbourne. Fire investigators said it appeared that a lit cigarette had been dropped onto combustible materials in a wastebasket. Dorset and Wiltshire Fire and Rescue Service warned cigarettes which do not comply with EU law can burn faster and hotter, without the capability to self-extinguish. Fire safety manager Stuart Granger said: "If they are dropped they can start a fire very quickly. If you are buying or selling these cigarettes you are putting yourself and others at risk. "EU compliant cigarettes have two fire safety bands along their length. If the cigarette burns up to the band and is not inhaled upon, it will self-extinguish." Campaigner Julie Grant, whose mother died in a fire started by an illegal cigarette in Spalding, Lincolnshire, in 2012, said: "I am saddened to hear that another life has been taken through the use of illicit cigarettes. "I am and will continue to campaign for harsher sentences for those caught selling these illegal cigarettes."